“Three men were killed and 11 others injured after the building in Kasavanahalli (suburb)crashed down at around 4 p.m. ,” Home Minister Ramalinga Reddy told media here. “The number of those still trapped under the debris is unclear. The National Disaster Response Force (NDRF) personnel will continue to carry out rescue operations,” he said. State fire services personnel estimate at least 10 others to be still caught under the debris. Out of the 11 injured, four suffered minor injuries, while seven were hospitalised. “The building seems to have been constructed using poor quality material due to which we suspect the crash occurred. Police is on the lookout for the building owner, Rafiq,” the Minister said. The building was at least six years old and was under renovation, Deputy Commissioner of Police, Whitefield division, Abdul Ahad told the media here. The exact reason for the collapse and the details of the workers are yet to be ascertained, he said. 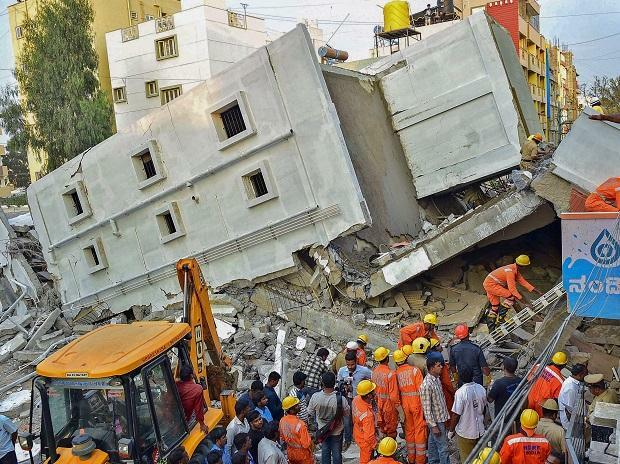 J. George, Karnataka Director General of Fire and Emergency Services M. N. Reddi and senior police and civic body officials inspected the premises of the collapsed building. “The government will give Rs 5 lakh compensation to each of the families of the deceased,” George said. In October last year, five men and two women were killed as a building collapsed in the city’s southern suburb of Ejipura after a cooking gas cylinder exploded.